Bosses at a pub in Hoghton which was gutted by a fire just months after a £1m revamp have sworn to build the establishment back up again. Thwaites has pledged to rebuild the Grill & Grain at the Boatyard following the devastating blaze on Wednesday, April 12. The popular Riley Green bar and restaurant had only reopened in November after a £1m transformation, including a large wood-fired grill and microbrewery. Investigators have said the fire was accidental but have yet to reveal the exact cause – and due to the extent of the damage a definitive cause may not be known. Thwaites director of Pubs and Brewing, Andrew Buchanan, said: “While the investigations are taking place we can’t access the building. “As soon as they have concluded, we will make the building safe so we can access it and start planning the future. “We don’t know at this stage what work that will involve – as soon as we gain safe access we will have structural engineers and architects on site to advise us. More than 60 firefighters, eight fire engines and two cherry-pickers were needed to quell the inferno at The Grill and Grain as the flames tore through its roof and interior. No-one was trapped in the building and there were no injuries. Gallons of water was hosed onto the building with crews pumping from the nearby canal. A dam was set up along the edge of the building to prevent any pollution re-entering the water. 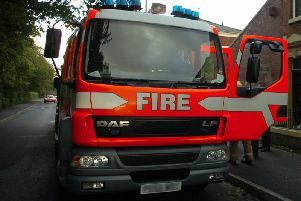 Staff stood shivering outside as they watched their place of work go up in smoke. The roof had collapsed as trusses were burnt through. Customers also expressed their sadness at the loss of the popular pub.